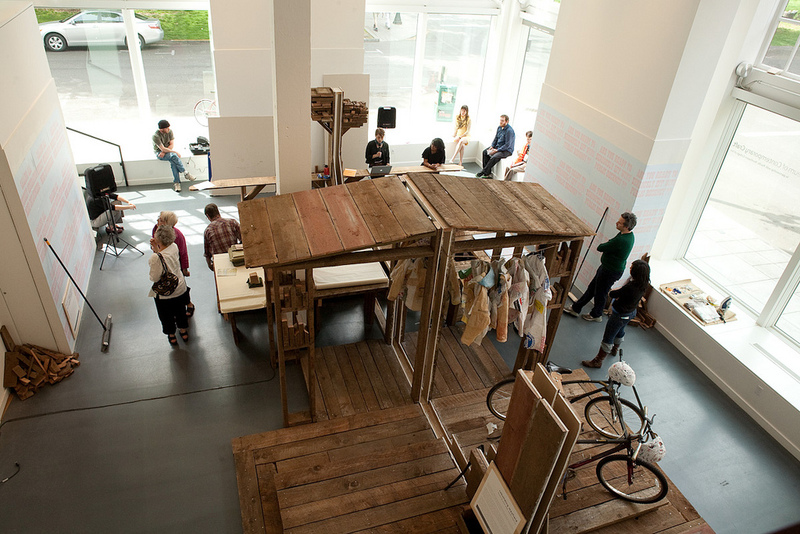 In Rebuilding Mayfield, Sara Black and John Preus performed a live build-out of the museum’s ground floor, starting with inherited lumber and artists’ requests and treating the gallery as a workshop space that acts simultaneously as platform, town square and performance installation. This structure will become the staging area for all subsequent resident artists, who will transform and manipulate the space through their performances and objects. Limited to one-way verbal communication through a small portal cut into a 24-foot central wall, Preus and Black attempted to produce two identical worlds on each side of that wall in an exploration of the zone between transmission and reception. In the spirit of the “exquisite corpse”, Sara or John (each leading the design and communication on alternate days) would respond to the previous day’s build out. Through a single one-way utterance at the outset of each day, instructions were spoken through the central portal, the remainder of the day left to interpretation and building. At the end of the two-week build-out the central wall was removed to unveil similarities and distinctions. Rebuilding Mayfield examines the condition of subjectivity, the interdependence of what is inherited and what is produced, and the uncertainty of perception. 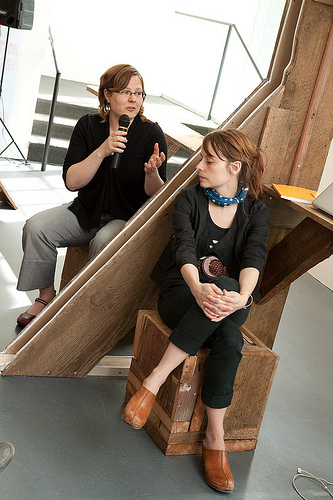 “When do you become an expert?” asks Sara Black, “When are you approached as an expert?” These are the kind of issues of practical intersubjectivity that Black and her longtime collaborator, John Preus, hope to bring up in the minds of viewers of Rebuilding Mayfield, the performance installation they have created at the Museum of Contemporary Craft in Portland, Oregon, as part of the Chicago-heavy group show ”Gestures of Resistance,” curated by Shannon Stratton and Judith Leeman. The concept of the piece begins with Black and Preus agreeing to build on-site various items requested by other artists in the show– a table, a bench, a cube, a pagoda—using wood from a recently demolished barn in the Portland area. The hitch that marks their gesture as conceptual as well as generous is that over a ten-day period Black and Preus worked on every piece collaboratively while separated by a tall drywall barrier, in which a miniscule hole was cut to facilitate verbal but not visual communication. The glassed-in two-story atrium of the Craft Museum, located in downtown Portland, provides the most visible working space the artists have ever enjoyed, an ironically appropriate venue to be the first in which they have allowed themselves such limited communication. The title, Rebuilding Mayfield, refers to words uttered at the end of the Guinness Book of World Records’ longest “telephone” whispering game on record, a testimony to the constantly frustrated utility of language. Adding this reflective dimension to the collaborative aspect of their shared practice was important enough to Black and Preus that they have suspended their work with the larger group Material Exchange, with whom they have been associated since 2005. 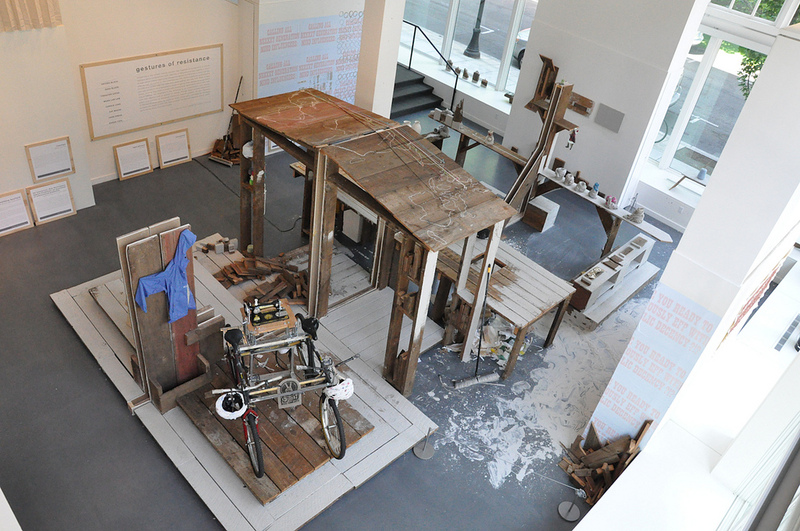 In Material Exchange they worked alongside Alta Buden and David Wolf on a wide variety of projects, including commissioned carpentry, site-specific installations. educational workshops, and mechanical game design, all making poetic yet sturdy use of salvaged materials, and always in response to a request in a specific context. What has changed in this new streamlined collaboration is not the emphasis on solid craft in service to particular needs, but an interest in turning away from some of the connotations their work had begun to take on, particularly regarding merely utilitarian diversions from the waste-stream, and the newfound marketability of “D.I.Y. craft.” Their fascination with the complex relations of materials, tools, and language, especially as a largely ad-hoc process occurring in time, is meant to result in objects that do not pretend to strike a grandiose blow against the contradictions of capitalist production. Instead these handmade artifacts might offer a glimpse, through a tiny hole perhaps, of a charmed pastoral universe that could be or might have been, in which the walls typifying modern existence crumble to scrap, ripe for “creative reuse.” Or simply, as Sara Black would have it… use.